Larabar keeps life simple with no more than 6 ingredients to each bar- Cherry Tart is simplified to 3 ingredients! It’s nice to what all the words on the ingredients lists mean. All of the bars are vegan, gluten-free, soy-free, dairy-free kosher, so there’s no need to worry if it will or won’t fit with whatever your diet choices are, or tastes. 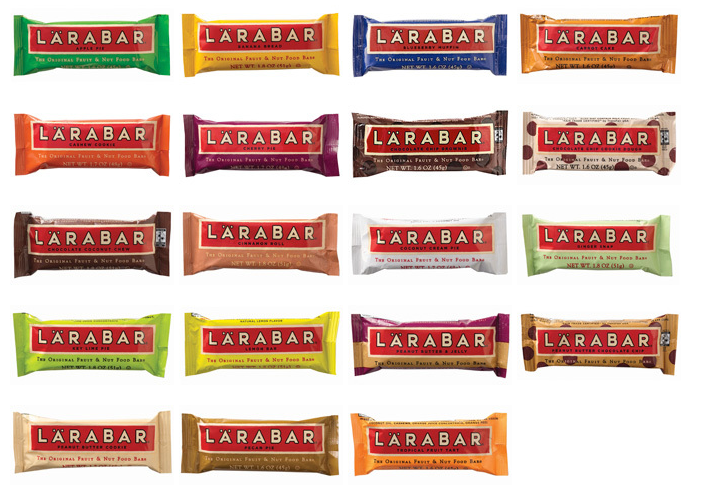 Larabar comes in a treasure of flavors, including key lime pie, chocolate espresso, cherry tart, chocolate cherry tart, apple pie, blueberry muffin, cashew cookie and more. I go absolutely crazy for these bars, and can’t wait to try one of their newest flavors, Bananas Foster!